LG has set out its stall (well, metaphorically at least) ahead of this year's CES expo in Las Vegas, with the early announcement of a series of home threatre products. Pick of the bunch is the NP8740 wireless audio system which will allow users to stream music around the home, in much the same way as the Sonos' award-winning multi-room audio solutions. The NP8740 can be used by itself or combined with more of its kin, via Wi-Fi to ensure tunes reach the bedroom, kitchen and living room, or anywhere else around the domicile. Users will be able to play the same track in all rooms (party mode), or different music in different rooms (personal mode) depending on the setting. "LG's Wireless Audio System, winner of a 2014 CES Innovation Award,gives users the power to choose from virtually limitless home audio configurations," the company said in a press release on Monday. "This is possible because the NP8740 runs the latest mesh network technology, which includes dual band Wi-Fi support (2.4/5GHz) to deliver high quality streaming music throughout the home. Each wireless speaker not only produces rich sound with clarity and depth, but also sends the sound out in multiple directions. Several speakers can be set up in any combination of rooms, connecting an entire house under a single system." Alongside the Sonos rival is the AB540W SoundPlate media receiver for 32- to 55-inch, which also features a built in Blu-ray player and Smart TV apps. 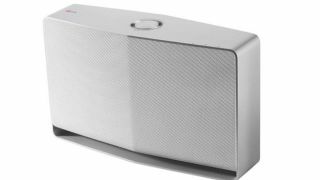 It also comes with a 4.1-channel, 320-watt amp and external wireless subwoofer. Alongside that duo, on the LG stand next month, will be the NB5540 Sound Bar to accompany LG's super-thin flatscreen televisions. It brings 4.1 channel support and can connect via HDMI or Bluetooth. LG hasn't revealed pricing or availability for the trio, but all should be revealed at the beginning of next month when CES gets underway. CES 2014: The biggest tech show of the year is almost here. Here's what to expect.